finding out about these speakers. Stig, Thank you for the info. I'm might get into it inside to see about the mods I see they're corner speakers. I searched but I couldn't find anything by Jensen that resembles them. I'd really like to find out where the cabinets came from. HD, Thanks for the info. "Rear firing" ? Not sure what that is. Are you referring to the open backs? There are back cover panels that go on the cabinets, I just don't have them on right now. There is a Klipsch strip on the bottom edge of the elec board that says Type A. What's type does type A mean ? See pics. The wiring pic is from the other cabinet. It doesn't have any modified wiring like the other pic showing some jumpers. Btw, the brown speaker wire is mine to the other speaker I've got the front grills back on and don't have the bottom speaker diameter. Al at alkeng.com says they're not by Klipsch so I'll go with that but the question remains who made these ? These weren't cheap cabinets to make and they don't look like they were ever for anything else. Where might these be from I wonder? Any of you cabinet people ever seen anything like these? They look like something from a church or school auditorium or something. Thanks. Each of the back of the horns have a Klipsch tag; PK K-55-v / serial #10035 and #10041. I don't know anything about speakers. I'll have to go back and look for the other numbers referred to here. I do not think these are home made. The cabinet work is A1 and there's no evidence there was ever anything else inside them to think they used to be something else. . 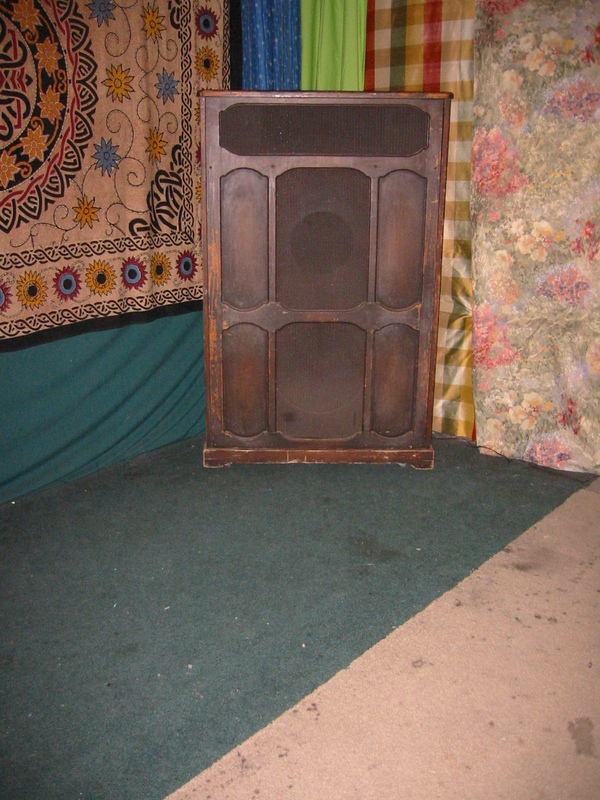 Here's 19 pics of my vintage Klipsch speakers. I'm looking for information about model, year. mfg, rarity and value. http://montereymusicclub.com/klipsch/klipsch.pdf Thank you.